The Unison Corporate cartridge life cycle, guided by the principles of zero waste and the circular economy, occurs in the EU. Driven by our commitment to corporate social responsibility and guided by the principles of zero waste and the circular economy, Lexmark’s A4 CS/CX and MS/MX Corporate Cartridges further advance the sustainability innovations delivered by the Unison toner print system. The Corporate cartridges are manufactured in the EU. This ensures consistent product availability, minimises supply chain environmental impact and maintains production within the local economy. Keep up-front costs low and quality high with Genuine Lexmark cartridges. Standard Yield cartridges offer a lower purchase price and contain fewer pages than High Yield cartridges do. Perfect for low volume printing. 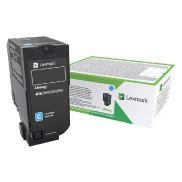 Lexmark Return Programme cartridges are patented print cartridges sold at a discount in exchange for the customer’s agreement to the licence requirement that the cartridges will be used only once and returned only to Lexmark for remanufacturing and/or recycling. The Return Programme cartridges are licensed for single use only and are designed to stop working after the delivery of a fixed amount of toner. A variable amount of toner will remain in the cartridge when replacement is required. In addition, the cartridge is designed to automatically update the memory in your printer to protect against the introduction of counterfeit and/or unauthorised third-party cartridges. If the customer does not accept these terms, replacement cartridges sold without these terms are available through www.lexmark.com. Up to 3,000 standard pages in accordance with ISO/IEC 19798.